Minions! Those crazy yellow hydrant looking hellions – who do everything en masse and scream in a bastardized pan-Europe/Asian/American language – are funny. They look and sound funny and they are such innocents that life is a constant adventure which is funny to us jaded humans. And now they have their own movie. 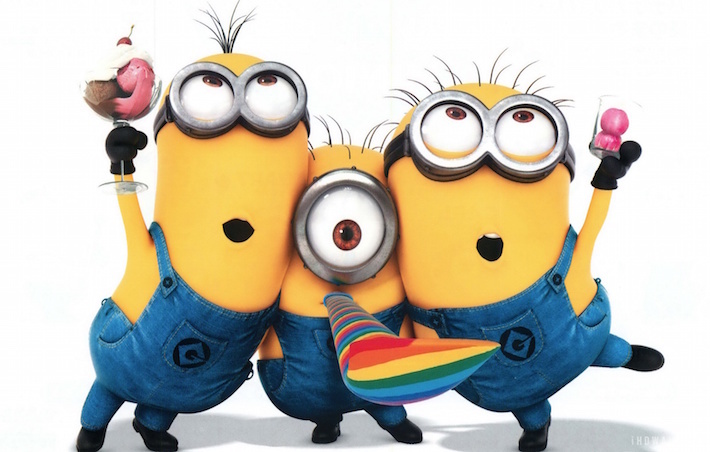 Minions is the Despicable Me origins film, the prequel in which we learn important facts. Minions pre-date the dinosaurs and have always wanted someone nice and evil to lead them. For millennia they searched and found suitable leaders, only to have them die. Vampires, corrupt leaders, beasts, henchmen and hooligans, next level evil guys. A highlight of the film is the stunningly sophisticated, hilarious sequence of the Minions marching through history, touching on moments of evil and the perps as they adopt one after another. They walk the ground that man walked, only as a sea of high-pitched screaming yellow, denim wearing enthusiasm. Cut to 1968 and three Minions (Bob, Stu and Kevin) hear about Villain-Con taking place in Orlando. Surely to goodness they can find someone there whose badness will inspire them to new heights of being? They hitch a ride to Florida with a seemingly nice suburban family also headed that way, leaving a trail of bloodshed behind them. That’s right; there is violence similar to that of Wile E. Coyote and Road Runner brand. Once at Villain-Con they win the chance to intern with superstar-level evil in the form of Scarlett Overkill (Bullock) and her slimy evil husband Herb. Bob, Kevin and Stuart assigned to break into the Tower of London and steal Queen Elizabeth’ royal crown, which they are more than delighted to do. So it’s off to London at which point the films problems start piling up, but it’s not serious enough to dismiss the film. Pacing is problematic; there may be too much Minionism and too little relief. The comic set pieces aren’t threaded together at points, but there are many smiles to be had. Kids are sure to enjoy it because they don’t care much about these plotting / pacing matters. And the grandparents who may take the kids to see the film will appreciate the 1968 soundtrack of Beatles, Stones, The Spencer Davis Group, The Turtles, the Kinks, The Doors, The Who, and for heaven’s sake “19th Nervous Breakdown” in a kids animated comedy? Wow.